Gold Ahoy slots game offers players a treasure hunt play. Gold Ahoy is a slots game developed by NextGen Gaming, now part of Amaya Gaming. This game has a theme of pirates and treasure chests, and it has all the required elements. The player will find that all the action takes place on a deserted tropical island with palm trees and deep blue seas, there is a swarthy piratical character and there are plenty of treasure chests filled with gold. The soundtrack is lively enough to keep players on their toes. The symbols are a sabre, a treasure map, the important treasure chest, a parakeet, and of course the pirate himself, pictured with a large flowing beard. Gold Ahoy also provides the player with two great separate bonus features. Gold Ahoy is a five reel slots game, with three rows and up to twenty five pay lines. The reels are part of the theme of the game, and are decorated with gold and bleached skulls. The high value symbols include the pirate ship, the Skull and Crossbones, a half buried rum bottle and a cutlass. The standard playing cards from nine and ten through to the Ace make up the lower value symbols, and are decorated with more pirate graphics. The pirate himself is the Wild symbol, and he will substitute for all the other symbols except the Treasure Chest and the Treasure Map, which are the Scatter bonus symbols. The standard jackpot is worth 25000 doubloons, and is paid when five Pirate symbols appear on an active pay line. The Treasure Chest bonus is triggered when the player lands on three or more of the Treasure Chest Scatter symbols anywhere on the reels. In this bonus round the player has to choose one of the chests that are on display, and that will reveal the prize he has won. If the player has luck on his side, he will find the Win All chest, which means he will be awarded all the prizes in the displayed chests.. 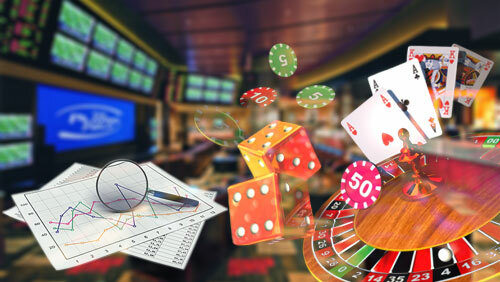 The Free spins bonus round is triggered when the player finds three of the Treasure map Scatter symbols anywhere on reels three, four and five. Once this round is activated, the player will see a second screen where he will encounter the Dig feature. This means the player has the opportunity to choose some likely spots to dig for the treasure, and this will determine the number of spins that will be awarded. This can be any number up to thirty, and the value multiplier that he will get on his winnings can be up to four times. More spins can be won during this round. If the Treasure Chest bonus is triggered in this round, the player’s multiplier will be used to multiply the bonus prize in the Treasure Chest feature. There is a Gamble feature that is also a part of Gold Ahoy. The player can play this feature by clicking on the Gamble button below the reels. This he can do after any win that he has made. The player has the chance to double or quadruple that win by guessing the colour or the suit of the next card drawn. The win limit is five correct guesses, but the player should remember that if he gets it wrong he will forfeit all the winnings he tried to gamble with.